We happily engage our young members in a number of age-appropriate opportunities. Click on the headings to find full descriptions and gathering dates for each program. You are always invited to contact our program leaders to set-up a meeting or phone conversation. They can also introduce you to members who have participated and enjoyed these different program offerings. Tot Shabbat engages very young kids (ages 2-6) and their caregivers in singing and dancing in sweet celebration of Shabbat. Meeting for one hour, approximately two times per month, Tot Shabbat is meaningful fun for all the participants. There is no charge and drop-ins are always welcome! To learn more, contact Rabbi Joysa Winter, Education Director & Tot Shabbat Coordinator. The Congregational School is for children 5-13 years old. 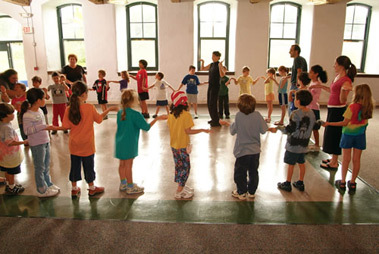 The children learn Hebrew, prayers, history and ethical ideas connected with being Jewish. Children are respected for their ideas and learn through projects and active lessons. To learn more, contact Rabbi Joysa Winter, Congregational School Principal & Tot Shabbat Coordinator. We offer a great array of programming for Mishkan teens led by Rabbi Joysa Winter, our Education Director. She is always eager to hear ideas from teens and parents. You can reach her at rabbijoysa@mishkan.org. We engage our teens through a range of programs geared just for them, including Tri-Shul Teen Youth Group; Teen Leadership Seminar and Food for Thought. We are eager to partner with our teens in creating dynamic and meaningful programs. Tri-Shul Youth Group brings teens together from Mishkan Shalom, Jewish Children's Folkshul and Germantown Jewish Centre. We also offer our older teens the opportunity to prepare for Confirmation by following a Pathway to Confirmation which suits their individual needs and interests. Click here for full Teen Program and Pathway to Confirmation descriptions and to access Registration details. To learn more, contact Rabbi Shawn Zevit. Celebrations! is a family education program for children with special needs, their parents & siblings. Celebrations! meets on ten Shabbat mornings throughout the year, and also offers sensory-friendly holiday gatherings. This innovative program creates opportunities for families to experience Shabbat and holidays together and for children with disabilities to have Jewish educational experiences designed for their learning needs. Mitzvah Menshes is a social and social action program for young adults (ages 18 – 30) with special needs. Mitzvah Menshes meets monthly on Saturday evenings and features dinner, Havdalah and a mitzvah project. To learn more, contact Gabby Kaplan-Mayer, Celebrations! Coordinator.